Karl Mehlhorn says a dry patch in the south-west will spread nationwide – but the weekend will still be showery. 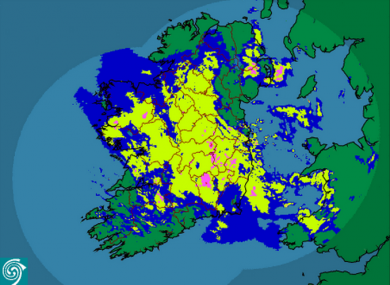 Ireland's in there somewhere... Met Éireann's rainfall radar as of 7:15am this morning. PERSISTENT LIGHT-to-moderate rainfall hit the country overnight and will continue through this morning – but in Munster a clearance is underway, with rain dying out here. This clearance will only slowly move to the northeast with parts of south Connacht and south Leinster also drying out during the morning and early afternoon. Rain will continue to affect much of north and east Leinster through the afternoon before also dying away here sometime during the late afternoon or early evening. Ulster will remain overcast and damp with rain on and off right through the day before dying away in the late evening. A further 10mm to 15mm of rain is possible in places on top of Thursday’s totals across most of the country with totals a little higher in Ulster before the rain finally clears here. Rain intensities will drop, but rainfall will remain persistent. The clearance will leave brighter skies, though showers may develop and move into Connacht and Munster during daytime on Friday. Winds will be blustery from a west to northwest direction, and it will feel cool with the wind with highest temperatures of 10°C to 13°C – which is below normal for the time of year. A quick look at the weekend: a slightly better outlook, with some sunshine, but there will be some showery rain affecting the country on both Saturday and Sunday. Temperatures will recover only a little, with the airmass from the northwest keeping things on the cool side. Karl Mehlhorn is the founder of the Irish Weather Network. Follow on Twitter @Irelandsweather. Email “Weatherwatch: It’s still raining, but there’s an end in sight”. Feedback on “Weatherwatch: It’s still raining, but there’s an end in sight”.